DAYTONA BEACH, Fla. (April 10, 2018) – ATF & Gunslinger took on Circuit of the Americas (COTA) in Austin, Texas over the weekend. 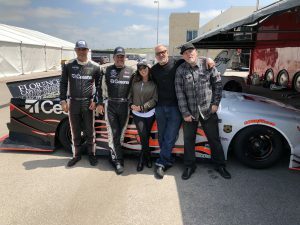 With their fleet of customized NASCAR trucks, the team made laps around the track with NASCAR Camping World Truck Series Champion Mike Skinner, ATF & Gunslinger team owner Andrew Franzone, and television personality, welder and entrepreneur Jesse James behind the wheel. The weekend marked a lot of firsts for the ATF & Gunslinger team – it was their first trip to COTA, it was the first time James piloted one of the team’s trucks, and it was the first time that Skinner turned laps around the 3.41-mile, 20-turn road course circuit. 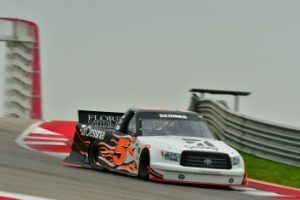 The event was part of ATF & Gunslinger’s Track Days program, where the team invites their partners and guests to ride shotgun around America’s premier racing circuits with Skinner behind the wheel in a modified two-seater NASCAR truck. The team also utilizes Track Day events as an opportunity to fine-tune their “Skinner Special.” With a Toyota NASCAR motor and a customized body, the Skinner Special was built by the ATF & Gunslinger team to pursue speed and records at iconic tracks, courses and motorsports events. The ATF & Gunslinger team will return to Sebring (Fla.) International Raceway for additional track days events later this year.